“YukaLoopa” is a patch that I created for Yuka C. Honda of Cibo Matto fame.Â Itâ€™s designed to work with her Akai APC-40, which is why the patch has a similar layout and basic functionality as Ableton Live.Â There are, however, many fundamental differences that make this patch rather unique. Two of the most profound differences are that YukaLoopa is largely a fixed system causing it to function more like an instrument than an environment and that the part of the patch that plays back sound files performs more complex functions than simply playing a file at a specified rate and pitch. I intend to create several custom DSP effects and add custom grid functions for YukaLoopa, but I will briefly summarize some of the things it does now. 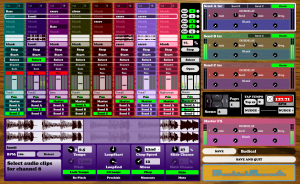 YukaLoopa can perform many basic functions that are common to other audio applications, such as drag nâ€™ drop of sound files, recording multiple sound files simultaneously, initiating playback of sound files individually or in groups, independent control of tempo and pitch, tap tempo and scroll over hints. It also performs many common mixing functions such as soloing, panning, volume control, rearrangeable aux FX buses, and master bus recording. Launching a scene triggers the playback of all the clips on that scene, but it can also change the values set by the GUI or on the APC. This allows Yuka to create scenes with unique playback settings, routing schemes, mixes, and FX settings. Each channel has several settings that effect playback and are capable of creating a variety of glitchy effects. Engaging “Lilâ€™ Loops” allows Yuka to change the loop points and can create glitchy FX when the APC knobs corresponding to “LoopStart” or “LoopEnd” are continually turned to create super short loops because YukaLoopa continually randomizes the length of the super short loops. Engaging “Chop” causes the playback position to jump randomly. The frequency of these jumps is determined by the “Chop Speed” knob and the number of possible positions is set by the “Slices” knob. The “Chop Speed” knob also determines the rate of the re-triggeringÂ of the “Slide” function and the “Mute” function. Engaging “Slide” makes it possible that the playback will occasionally slowdown, creating a classic turntable slowdown effect. The likelihood that the effect will engage on a particular re-triggering is determined by the “Slide Chance” knob. Engaging “Mute” makes it possible that that the file will occasionally be muted. The likelihood that the effect will engage on a particular re-triggering is determined by the “Mute Chance” knob. I will be adding functions to YukaLoopa over the next few months and will create a short video showing the patch in action once it has more bells and whistles.